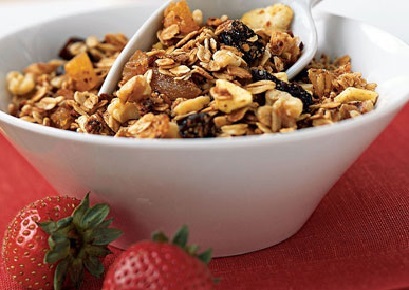 Use this restaurant Granola Recipe to make a really great tasting and nutritious breakfast. It’s perfect for when you are short of time but want to eat healthy and still enjoy a delicious breakfast. Make this restaurant breakfast recipe ahead and store the cereal in an air-tight container or containers (canning jars?). Preparation time: about 20 minutes. 10-12 servings. 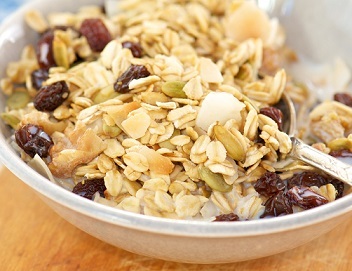 Add yogurt or fresh fruit for a tasty, nutritious and quick breakfast! Thank you for your visit. I am glad you found the website and I know you’ll also be pleased when you try this Granola and the other customer-tested, customer-approved restaurant recipes on the site. Enjoy your restaurant breakfast and the company of those you share it with. Did you know? Craisins are dried cranberries are made by partially dehydrating fresh cranberries. They are popular in trail mix, salads, and breads, with cereals or eaten on their own. Dried cranberries are sometimes referred to as "craisins," though the word "Craisin" is a registered trademark of Ocean Spray Cranberries.